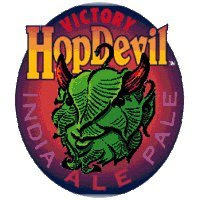 Two of my first beers of 2009 happened to be two hopped-up offerings from Downington, Pennsylvania's Victory Brewing Company. I decided to pit the two against each other without prejudging them based on any of the beer ratings websites. I'll attack the competition from the various components of beer rating, and in the interest of space I'll refer to them as 'Devil' and 'Wallop.' The 'Hop' seems a bit redundant. Appearance: Devil comes out quite cloudy, darker than orange but not quite to the candy cherry level. Let's call it light ruby. I tend to use ruby as a beer color quite a bit. Wallop is much more golden, while still cloudy. The color spectrum runs from pure gold at the bottom to a sort of amberish-melon at the top. Wallop definitely has the larger head of the two, but neither stick around for long. Edge: Wallop. Smell: Devil reeks of floral hops, as you can imagine. It's much the same as many IPAs out there, and although I don't want to bulk them all together, this isn't an aroma I haven't smelled before. Wallop gives me a little more complexity. Yes, those monster hops are instantly present, but there's a sweet side to this one, maybe honey, that I didn't detect in the Devil. With that said, if my nose could subconsciously gravitate toward one smell, I bet it'd pick over-the-top hops. Edge: Devil. Taste: Well. I must say off the bat that neither of these would rank among my top ten hopfuls, and that is disappointing. Devil's flavor actually made me raise my eyebrows a bit. It was, without exaggeration, like eating a fresh hop right off the plant. I didn't get any citrus, no sweetness, and not much depth. A potent kick to the taste buds. Wallop wasn't as blatant, and had much better balance. It's crispier and brighter at the start, but slows down to a smooth butter. And the hops are bold enough. Plus, there's a bit more alcohol in this one. Edge: Wallop. Mouthfeel: I like Devil here. It has a huge pine finish and leaves the palate quite dry, which I love. Wallop is dry as well, but it's much more smooth going down than it is clingy. Edge: Devil. Drinkability: As I said earlier, you won't find either of these on my best of '09 list (already thinking about it). Therefore, I wouldn't seek either out at my local beer store in favor of a different staple. Wallop is a seasonal, but Devil is available all year. They're both drinkable. They're both decent. I guess I just like Wallop a bit more. Edge: Wallop. Final tally: Hop Wallop 3, HopDevil 2. It's really not that close for me. The difference in taste is enough to sway the whole argument.